Master-development and tourism company Omran said the work on the Phase Two of the Oman Convention & Exhibition Centre (OCEC) was progressing well and the project was on track for completion by June 2018. The fully-integrated OCEC precinct - which includes four hotels (two under construction and two in the planning phase), a future shopping mall and commercial business park - takes strides towards completion. The soft-launch of the much-anticipated Crowne Plaza is on track for October 2017, bringing over 296 hotel rooms to business and leisure travellers visiting the OCEC and Madinat Al Irfan, said a statement from Omani developer. The JW Marriott Hotel is set to be fully operational in June 2018, bringing a further 304 rooms to the destination, it added. According to Omran, the Phase One of the purpose-built exhibition centre is already open to visitors, while the second one is at an advance stage with all the structural, civil and MEP (mechanical, electrical and plumbing) works nearing completion. The focus is now shifting to the finishing and fit out works, it added. Omran's announcement comes following a site visit by Dr Ali bin Masoud Al Sunaidi, Minister of Commerce and Industry, chairman of board of directors at Omran along with CEO Peter Walichnowski and Said Al Qasmi, the chief project officer for OCEC. Developed by Omran within Madinat Al Irfan – a world-class, urban mixed-use development, OCEC is located only 4 km from Muscat International Airport. Work on the Phase Two of the project, which includes the multi-purpose hitech auditorium with a 3,200-seat capacity and a banquet building, featuring two large ballrooms, a theater of 450 seats, meeting rooms and the central food-court, is in full swing. 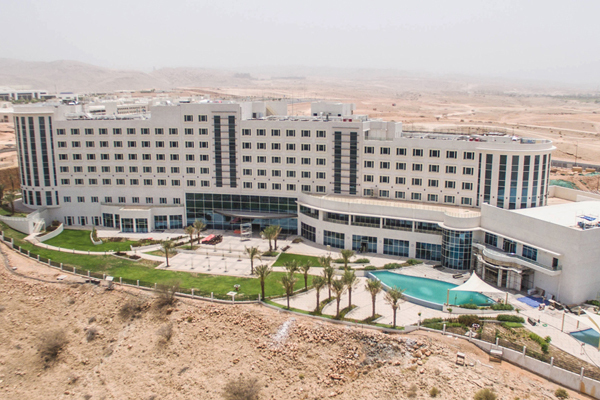 While the Oman Convention & Exhibition Centre is being planned for operations by June 2018, banquet building will be available for booking for events ahead of completion, said the developer. On the project, Al Qasmi said: "The OCEC was designed specifically to increase the MICE (meetings, incentives, conferences, and exhibitions) sector offering in the Middle East. By developing integrated conference and event spaces, we aim to provide a new and exciting option for business travellers – putting Oman on the map as a global MICE destination." "At Omran, one of our main aims is to improve the socio-economic development of the Sultanate by building innovative projects, such as the OCEC precinct, which drive the growth of the tourism sector as well as engage with the local community," he stated. Pioneering an institutional framework for planning, development, and regulatory control, Madinat Al Irfan delivers the highest standards of urban development for Oman and the region. According to Omran, the project was designed to establish a new urban centre within the heart of Muscat – home to a living, working and visiting population of approximately 280,000. Its innovative infrastructure strategy, adhering to world-best practice, aims for significant improvements to the project’s overall sustainability performance, including 50 per cent reduction in energy demand, water use and car reliance, it stated. Walichnowski pointed out that Madinat Al Irfan had received interest from local, regional and global investors. The area offered for investment in phase one in Madinat Al Irfan is estimated to be 1.6 million square meters, with unique topography and picturesque scenes. Madinat Al Irfan is surrounded by main roads in Muscat including Sultan Qaboos Grand Mosque road from the north, and Muscat Express way in the South. The allocated investment sites will be used for various purposes including residential, tourism, commercial, education and health care. "As we progress with the development, the project will shape into a cosmopolitan city on par with global standards," he remarked.